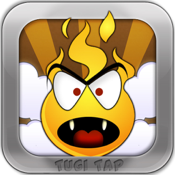 Tugi Tap is a fast action game in a nice designed cartoony world. There are multiple "Tugi's" flying/falling and swimming accross the screen of your iPhone or iPod Touch. Tap them as fast as you can and in the meantime try to make combinations of the same "Tugi's" to get more points and combos. You can also find specials that give a nice effect and can give you a lot of extra points. (Tap the big Tugi's 20 times to make them explode). The better you are the more stars you collect, your job.... collect all 3 stars for each level you play, are you fast enough? We didn't stop here, we also included 2 mini games to test your speed skills. Show your friends how fast you are and try to improve your skills and highscore. * Multiple Levels To Choose From! * Collect Bonus Points For A Better HighScore! * 2 Extra Mini Game's To Test Your Speed Skills! * Extra Level "Into Space"